Evoking dream-like fragments of real or imagined memories, Mari Mahr’s series of works that reflect on personal histories and journeys are drawn from her Hungarian mother’s photographic archives and found objects. The play with scale and objects confuses space and time, becoming uncanny glimpses into a supposed reality that presents tableaux vivants recalling, for instance, communist posters (‘Remembering the land – Mezögazdasági Emlék’) or ‘Alice in Wonderland (A few days in Geneva)’. Trained as a photographer in Budapest, Mahr was a press photographer before migrating to England in 1972 where she continued her studies. Her earlier works incorporated text, forming a strange and oblique narrative that reflects on a wide range of stimuli including films, events and situations. 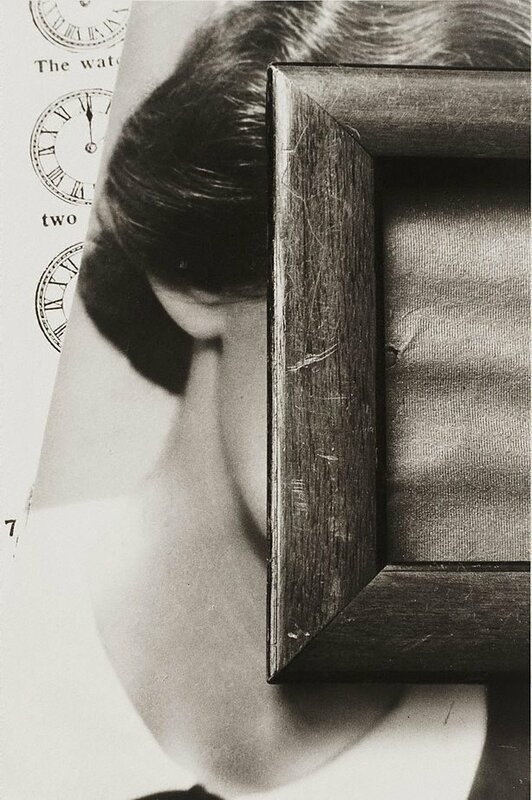 Drawing on the photomontage technique of the dadaists, futurists and surrealists, Mahr’s complex imagery incorporates typography, objects and images to create compositions that are then photographed, flattening the depth of plane and confusing the reading of the fictive image. In ‘13 clues to a fictitious crime circa 1940–1941’ we are drawn into a perceived mystery: a telescopic view of a building, an aerial view of a bird flying over a town, the letter A, the number 2553, a clock reading ten past twelve, a half-hidden face, a message, fish, stars, a piano and the book ‘A house of gentlefolk’; all clues that lead back into themselves. There is no accurate narrative and Mahr herself tells us that ‘No real crime has been committed’.2 We have instead been part of a fiction that, like the dadaist and surrealist games and images, fractures reality and our perception of it, reflecting the surrealist obsession with sight and blindness. Signed and dated verso, pencil "Mari Mahr 84".